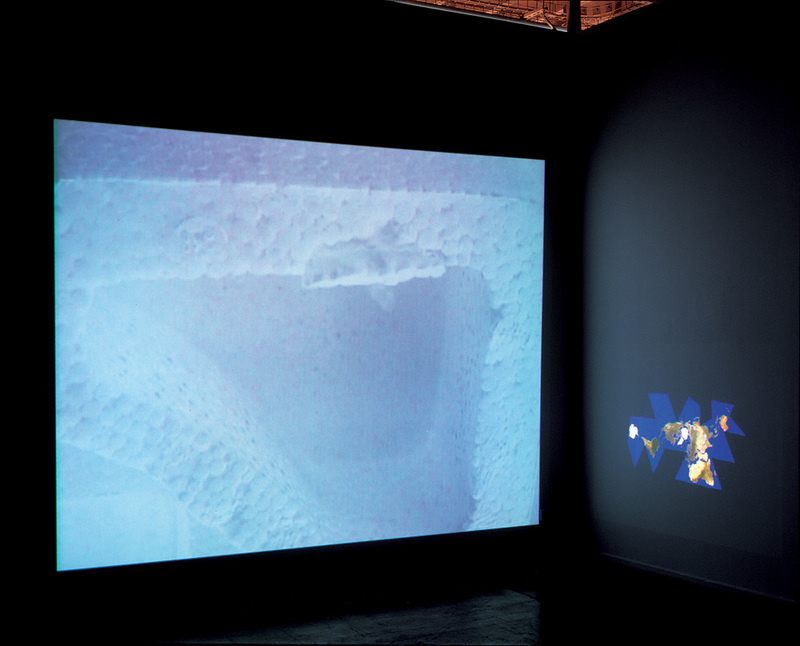 What is the connection between the two projections in the main gallery, the polystyrene video and the Dymaxion animation? A while ago I was putting together images for a website, scanning old photographs of works and installations. Of photographs I have taken, there are very few sensible long shots of works in situ. 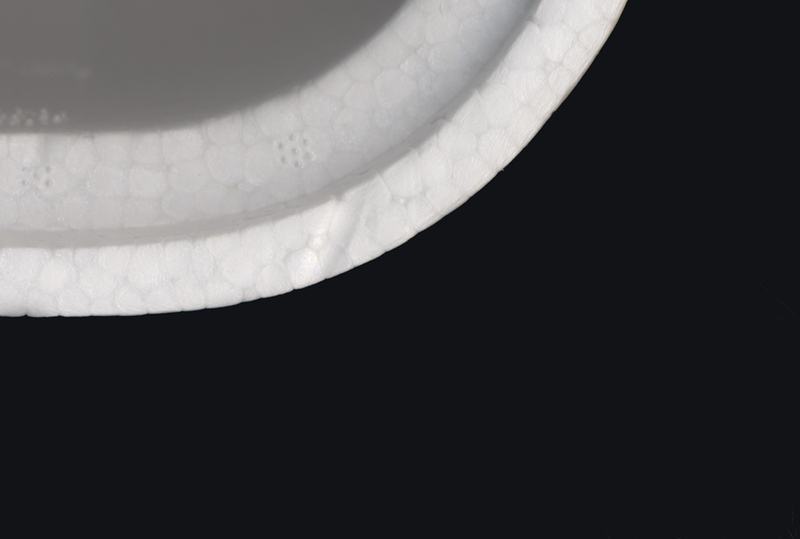 Mostly they are these extreme close-ups of surfaces and effects, reducing objects to textures. I make things and then go through a process of blowing them up to become habitable worlds, so every chip and imperfection, every fold and bubble become features of some enormous landscape. This was a really useful realization. There’s a really nice essay about Mikala Dwyer’s work that talks about remembered childhood environments, about the disparity of mental imagery with real-world size. There’s a strange relationship between scale and desire. I think one of the reasons I find sculpture so exciting is that I’m continually spatially bewildered – I have terrible depth perception. I’m utterly surprised by the relation of one object to another, by real and apparent distance (I’m a really bad parallel parker). A lot of my time is spent walking around behind things and going ‘oh’. So I’m really interested in representations of space, in maps, and in the way mapping influences your experience of space. I’m thinking about that a lot right now, being in a new city, trying to find things and get a sense of the relationships of one place to another. Psychogeography. The mental scale of the visitor is strange, you get into a plane, a capsule that compresses distance, and then you end up in some unknown city, walking, or being driven around the convolutions of underpasses and one-way streets. So your passage through space goes from this exaggerated aeronautical scale, hundreds of kilometers an hour, to a pedestrian one: five or so an hour. Maybe part of my current preoccupation with mapping is an attempt to unpick that disjuncture. Also, coming from a little country, an antipode to the world my ancestors came from, geographical relationships become kind of obsessional. New Zealand often gets left off maps. So where does Buckminster Fuller come into this? I was mooching round the Net, and I came across this map that Fuller developed. His Dymaxion Map represents the landmasses of the world as more or less continuous, with minimal distortion in terms of size. There’s all that stuff about the politics of different map projections, the difficulties of representing something spherical as a flat plane, and the way distortions that occur often reflect political biases. The Mercator projection, which is around four or five hundred years old, makes countries in the far North and South appear much larger than the equatorial ones, maybe reflecting the imperial mindset. And once these inscriptions are made, it becomes hard to see the world any other way. I was reading the other day about the Great Circle route to Australia and New Zealand, which was this great navigational leap forward when mariners realized that the world was indeed spherical, and that though their Mercator maps told them that a straight line from a to b was the fastest way, in actual fact arcing around (by the map) cut a thousand miles off the passage. The animation of the Dymaxion map, which was made by Chris Rywalt (www.westnet/%Ecrywalt/unfold.htm) and which I downloaded through the official Buckminster Fuller website (www.bfi.org) reflects a different, contiguous, political reality, and also evokes Fuller’s idea of “spaceship earth”. He argued that there wasn’t any such thing as North, South, East or West, that these were flat earth ideas and that there was , just ‘in’ – towards the center of the earth, and ‘out’, towards space. The animation is open source, there for anyone to use, and I liked the utopianism of that gesture, too. And New Zealand is at the top! So I’ve got this globe flattening and unfurling, like some odd flower, chunky and skipping because the source file is a heavily compressed Quicktime movie, juxtaposed with a looped and lingering pass over the surface of some polystyrene, then there’s this triptych of composite scans of my ibook and its foam shell. All dealing with scale, representing and constructing things that the naked eye, the five kilometer an hour human body cannot apprehend. There are differences within the body too, with the size of touch. There’s a n image, the Homunculus, which is a drawing of a man with each part in scale with the number of nerve endings it possesses. It’s this really odd picture of a figure with enormous hands, feet, huge, bulbous lips, and an enormous toungue. An explanation of that feeling, when you get a stone in your shoe, that it must be some enormous rock, and when you tip it out, it’s a piddly little piece of gravel. Or like little kids who always want to put everything in their mouths, partly because rolling it round on your tongue is the best way of perceiving texture, shape, vagaries invisible to the eye. Makes me think of those little silver casts of chewing gum that Rosemary Trockel made, Mouthsculptures, she called them. The scans blow up the objects by about a factor of four, so an object that is designed to sit on you – a laptop – becomes big enough to be a piece of furniture. I think of the triptych as a kind analogue of the gaps between sight and touch. There’s an idea of the two senses being related, of touch being like a kind of close-range vision, and I was thinking about how big something seems to your fingertips versus your retina. Vision, unlike touch is discontinuous – as you look at things, your eye does this thing called saccadic scanning where it flicks around to build up a picture which your brain pastes together to form your field of vision. So the images are a weird kind of visual Frankensteining of two attempts to represent the unrepresentable: what your fingers and your eyes might think if your brain wasn’t smoothing the transitions and Vaselining the lens. Also they’re an attempt to use the means available – my scanner and printer – to produce large-scale images, which you’d normally have to go to a bureau to get done. They’re all that domestic A4 size; the ubiquitous dimension of modern paper life. But they cohere into something quite odd,that lacks the smoothness of something that just rolled off a megaprinter. You’re using editing the video on the same computer depicted in the composite scans. Isn’t that a bit solipsistic? It’s interesting how the process is so self contained, how it reflects the importance of means to my projects. I mean, one thing I get really het up about is shiny technology, I’m constantly cruising the Apple site, leafing through geek magazines for the five or ten thousand dollar solution to all my problems. It’s a dream. It’s excessive desire. When I got the my new computer I went through a whole romance; glazed and sweaty with the prospect of this big purchase (it’s the most expensive thing I’ve ever bought), trembly at the computer shop, a sense of elation, and then by the time I got it home, I could barely be bothered unpacking it. You forget how long it takes to get a computer set up the way you want it. It takes weeks to configure them so they feel like yours and not like some borrowed outfit. So then there’s this whole falling in love again, once you start really working out how to do stuff. For me that’s video editing, and I’m finally able to make work that’s been in my head for ages. It is solipsistic to make movies of the packaging of the thing you’re using to make movies. But it’s really just enacting a more subtle solipsism of new technology. The tools form your expectations and notions of the possible, as much as fulfilling them. And it’s classic fetishism, isn’t it? Mistaking things for persons. I know what I’m doing, my Frankfurt-School concience is telling me it’s wrong, but I don’t care. Maybe by making the obsession the subject of the obsession, I can somehow analyse or expiate it. But I’m not sure it works like that – maybe I’m just rendering exponentially this economy of desire – so a melancholy creeps in. What is the role of Science Fiction in your work? I grew up on budget space television – the toothpaste-tube futurism of old Sci-Fi programmes like Blake’s 7 and Doctor Who, which worked magical transformations on mundane objects – flashing coloured lights, laser guns with curly phone cords, kitset spaceships. It’s about transformation and also suspension of disbelief, but if you choose to continue suspending disbelief after the tv’s off and dinner’s ready, then how does the world look? I’m really interested in a kind of romantic notion of autism, of inability to put objects and people in their ‘proper’ relation. Like the classic storyline of the man who fell to earth, of the alien to whom the ordinary world is an exotic mystery. . Fredric Jameson describes Sci-Fi as history of the present, a mechanism for creating critical distance from the all-encompassing now. You can often effect that alienation by a simple play with scale. Bottle top spaceships again. The imagery of the main room also has an undertow of interplanetary images, a hint of satellite fly-bys, ringed moons. Objects hanging in a cold, black, Photoshopped outer space. There’s an argument that the spatial expansionism of the modern era – from Captain Cook to the Apollo project – has inverted, that dreams of other worlds, new worlds (although, of course they weren’t new to everybody) have become an exploration of miniaturization, compression,of atom smashing and microchip factories. This is linked too, to the displacement of production from the old industrial nations, the flows of capital that also shape worlds. Like the bottom of my computer says ‘designed in California, assembled in Taiwan’. How does the main gallery space connect to the installation that can be seen from outside the building? When I first arrived at Artspace, the whole gallery was pitch black. There was no light at all in the main spaces, The windows were blacked out. So the first experience I had was walking around blindly with one hand on the wall, and the other out in front of me. I did some drawings of the space in the dark. Eventually I got to see it with the lights on. Then after I’d been walking around the gallery for a week or so, plotting my show, I realized there was this crawlspace or corridor right around the outside of the gallery, and the bottom kind of fell out of my conception of the installation. It was great, because I had been having this difficulty with the relationship between these two sets of work I wanted to use, and this other, peripheral – yet in a way dominant – space, provided a counterpoint or subtext to the other gallery. The outside is kind of a ghost space; in this case, not accessible to the public, partly visible from outside, through the bars in the window, casting a light into the main gallery. There’s a bleed of fluorescent and day light over the partition wall, but for me the Dymaxion projection is the thing that hinges the two works. Being on a residency got me thinking again about that hoary old tyranny of distance stuff, about centers, peripheries, and cultural export. I’ve been dwelling on maps, and that particular representation helped me realize what people mean when they talk about how far New Zealand is from anywhere. I mean, I’ve spent 36 hours on planes, but it’s all just blank space and transit lounges. Looking at the landmasses all linked up and Aotearoa on the very edge of it explained something to me. Of course those complaints of distance are very much about senses of isolation from particular centers of culture, but even so, it’s odd to come to Australia and hear the same complaints, particularly when there’s a simultaneous political movement against the very problem of proximity, with the detainees, or asylum seekers or ‘queue jumpers’ coming in from Indonesia, just to the North. Woolloomooloo also has this economic, spatial division. There’s a veneer of money along the waterfront, with the new hotel, flash new apartments and the threat of further development. Then there’s public housing, ordinary newish municipal terraces, but also people hanging out under the railway viaduct, sleeping on the footpath or under tarpaulins. The wall drawing in a way diagrams this relation. 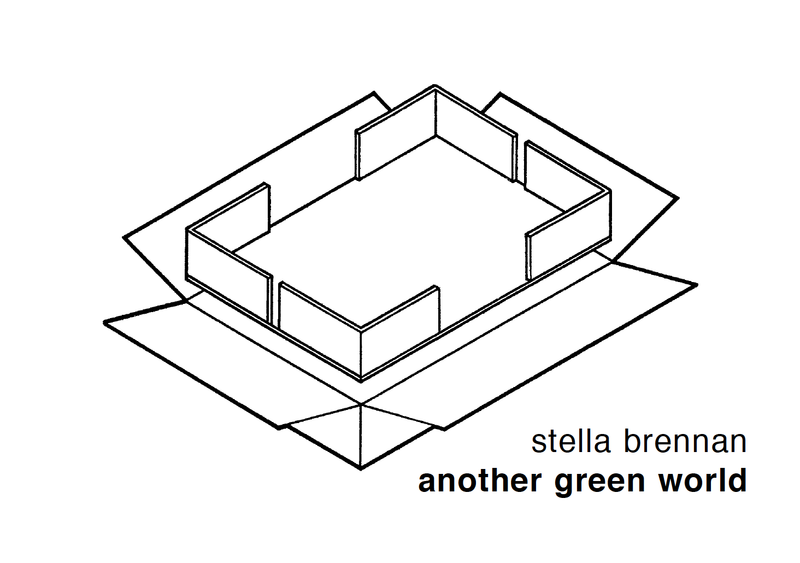 It’s part of a series of drawings I’ve been making based on unpacking diagrams from the inside of cardboard boxes. The imagery is very functional, dispassionate. The instructions are pictographic, there for when you’ve bought the product. They’re not trying to persuade you, or anyone else – make me – buy me – their aim is to help you get your new toy out of the box in one piece. They’re interesting images, iconic, but often really beautifully detailed. The last one I did was of polystyrene, with all the forms carefully delineated, those strange smoothed-out shapes. This one is more linear. I like the way it echoes the unfolding of the globe into the Dymaxion map, and the way it reminds me of the layout of the gallery – boxes within boxes. The drawing is executed stencil-fashion, with pigment rubbed into the wall. It’s a tactile process, a nice combination of precision and haphazardness. I think of these images as icons for some kind of future cargo cult, attenuated cultural signs for a silicate stone age. I guess the cavernousness of the gallery made me think of cave painting, too. I also think of it as a map, in a way. There’s those Smithson works, Hypothetical Continents, models of imaginary landmasses formed from piles of shells or broken glass. This is a pile of broken glass that is Atlantisand . That willful collision of logics, the mismatch. Like a suspension of disbelief. That collision of logic is part of what interests me in Melanesian Cargo Cults, too. People applying and modifying their tradional ways of dealing with the world to encompass the bizarre habits, strange technology and unimaginable wealth of European forces. Like that [lamont young?] that Nam June Paik performed – drawing a line and following it – a score, a diagram, a journey, a drawing. What’s the importance of materials in your work? When I studied sculpture, there was an emphasis on the Modernist notion of materials being in a way self-defining, and a somewhat macho emphasis on craft skills. I’m really grateful for that training, but it’s something I reflexively question now. I went through a period of making big, heavy, highly finished sculpture, and just got tired of needing five burly friends to move my work around. 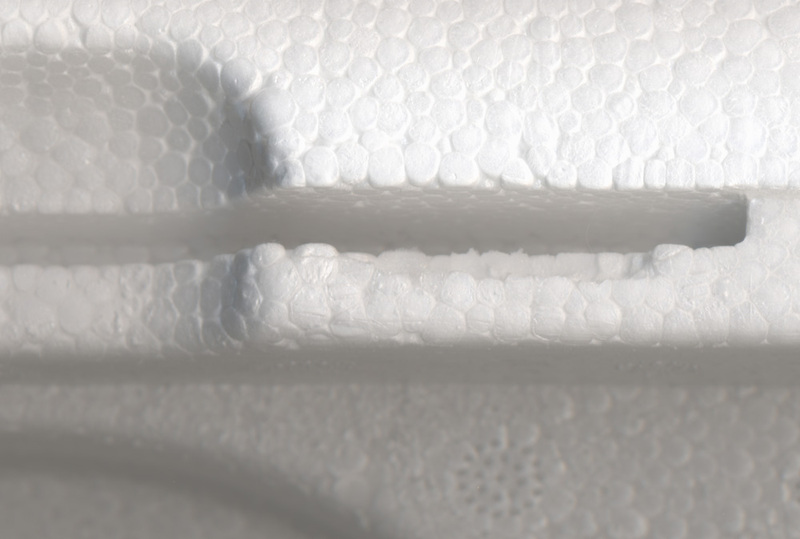 In that sense polystyrene is the perfect material – bulky, but insubstantial. Plus it’ll last a million years. I like temporary solutions that get fossilized. A lot of enery goes into packaging design, and sometimes I wonder how many people involved look at their work and think to themselves that they may have just produced one of the most enduring artifacts of contemporary culture, heading for eternal preservation in a landfill. Formally I really love polystyrene, the strange vacant objects made to be discarded – commodity husks. But as well as this attraction to the material, there’s a melancholy. It’s much easier to fetishise what other people throw away. The tang of new technology still clings to the packaging, so it’s also about wanting things you can’t afford. And, although it’s not entirely rational, or supported by the facts, there is this notion that it’s a kind of hyper-pollutant – persistent and morally bankrupt. As a response to that idea, a lot of technology now comes in recycled paper shells, like egg cartons, but with more nooks. My zip drive, for instance. Other materials I really like have a similar temporary, interstitial tang – tape, bubble wrap, pastic sheeting, cable ties, hot glue. I was walking in Chinatown on Boxing Day, and I came across this building that was half-finished. The workers were on Christmas break, and so everything was stowed away. It was really beautiful, this half built shop and office block, with improvised metal grilles over openings into the street, cables coiled and dangling out of holes between floors, granite facing shimmed up with bits of wood and G-Clamps, new glass with its protective plastic hanging off in long strips like shed skin. It was half-built, but could have been half-destroyed. Rem Koolhaas writes this thing about contemporary construction, describing silicone glues and sealants as this kind of spermy matrix holding the city together, bonding glass to marble to steel. I think of it like cartilage, a gristly and pliable substance that may harden into something else. His point was that the most essential component of the modern city is this essentially formless material, a translucent goop. It doesn’t necessarily have to do with poverty of means, this aesthetic, although that’s definitely part of it. It’s about impermanence, improvistation, and evasion of authority; be that the self-policing of ‘doing things properly’, or the interventions of building or sanitary codes. It’s linked to ideas of nomadic architecture, which in a way has everything to do with Aboriginal people sleeping under bridges. So what is actually going on in the outside space of the gallery? 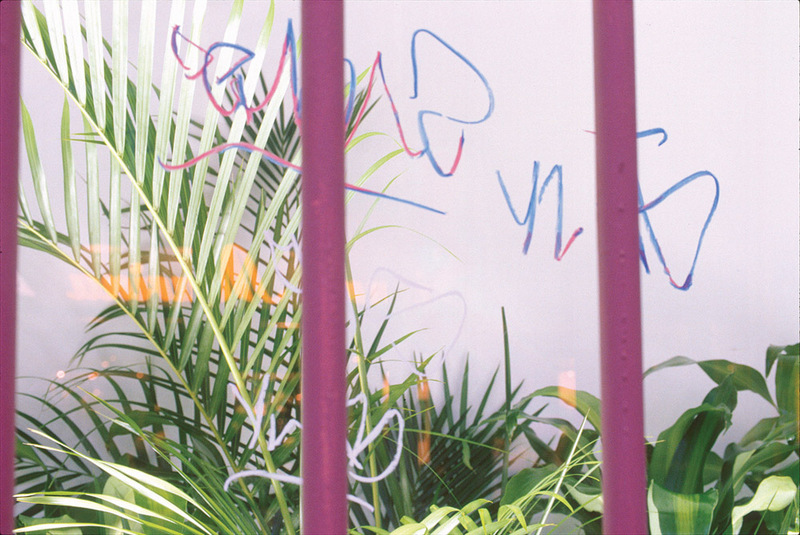 There’s a collection of plants placed on wrapped objects, seen through gaps in the windows. The plants are lit from below in a cheesy horror style. I’m modifying a peripheral space, which has been used for shows, but is currently a storage space. Making visible a non-public part of the gallery with its boxes, scaffold, bits of card, wood. But I’m preserving an air of mystery by partly obscuring the windows and wrapping and labeling everything. Everything is swathed in this protective skin of bubble wrap (international symbol of fragility) and poly-sheeting taped together. These materials, too, are invariably part of a gallery’s inventory. So I’m not introducing alien substances into the space. Then there’s the plants. The use of greenery is a classic method of humanizing otherwise forbidding or anonymous spaces. It’s an architectural panacea – like Frank Llyod Wright said “A doctor can bury his mistakes, an architect can only advise his clients to plant ivy.” Some artists use indoor plants to sketch an attenuated relation to ideas of the natural – like Broodthaers’s hall of palms and Astroturf or Ameleder’s alyssum bedded in tractor tyres. I’ve been documenting plantings in the foyers of some of the big towers in the CBD. Sneaking in and taking quick snaps, avoiding the eye of the guy on the security desk. There’s lots of glinty, brassy, glassy, granite spaces with strips of shiny greenery; palms marooned in atriums next to the obligatory piece of foyer scupture. In his essay Entropy and the New Monuments, about Science Fiction and Minimalism, Robert Smithson talks about the ‘architectural entropy’ of the lobbies of Modernist office buildings. Foyer spaces have this formal similarity in their hard reflective surfaces, their interstitial not-quite-private not-quite-publicness. Living things mollify them somehow. The websites of a lot of plant supply people quote a study done by NASA that showed certain types of plants particularly effective at removing airborne pollutants. So there’s also this doctrine of plants naturalizing and even detoxifying the sealed environments of modern commerce. An instant cure for ‘Sick Building Syndrome”. The irony being that a lot of these plants are hybridised, sprayed, artificially fed and short-lived. There’s a small range of bulletproof plants, often with a spooky gloss, that haunt the cattle pens of office interiors. But it works, this greenery. I was given an Anthurium for Christmas – ‘Pink Aristocrat’ – which was a really touching gesture because I’m in this studio that people inhabit transiently, and it’s true it softens the space up, makes it more homely. It’s this crazy pink hybrid lily with shiny alien flowers – very hard to kill, apparently. You’ve been talking about extraterrestrial pastoralism – it’s an alluring phrase, but what do you mean? I was thinking of colonization as Terraforming. There’s that science fiction notion of converting Mars to a green planet, of adding the right mix of chemicals, microbes and flora to make a breatheable atmosphere. Of forming another Earth, in other words. It’s a Sci-Fi staple, a cherished problematic. A new world in a new land, but one we’ll try to make like the one we left behind. Like one of the scientists in Tarkovsky’s film Solaris says “We don’t want to conquer space at all. We want to expand Earth endlessly. We don’t want other worlds; we want a mirror.” As early as the 1850s New Zealand Company literature was assuring potential emigrants that there would be nothing in the landscape remind them they were in a foreign country. People take their biota with them: Maori took kumara to Aotearoa, English colonists in New Zealand and Australia had their oak trees and gorse, their cabbages. It’s entirely understandable on a practical and an emotional level, but in Aotearoa, as in Australia, the ad-hoc introduction of species has caused some utter ecological disasters. It’s particularly pertinent here, just around the point from Farm Cove, site of the first, unsuccessful, European agriculture in Australia. There’s a vegetable garden in the Botanic Gardens, full of tales of agrarian misadventure. Alongside are plantings of food plants used by local people of the area. There’s this strain of colonial writing where the very shapes of the trees and the colour of the foliage is seen to emanate some kind of alien threat. On the other hand, appreciation of native species seems to come when the strangeness has worn away, with later generations. I’ve been to flats around Sydney from early part of last century that make a decorative point of using motifs like warratahs and other native flowers. A regard for the value of indigenous species has a lot to do with nascent nationalist feelings. But these plants don’t partake of any of that – they’re international corporate citizens, available most anywhere. At the supermarket, the hardware store. Instant colour, ubiquitous, non-specific and available for rent. They’re already space travellers. But what do hire plants have to do with magnified laptop packaging? Well, you have this crawlspace mutely, whitely encircling the gallery. And these enclosures for valued commodities, so there is a purely formal link, and then there’s the supposed functionality of plants as corporate lungs. With my obsession with packaging, I ended up doing some research into Christo recently. I guess I shied away from his work before because of its monolithic popularity, so I was surprised to learn that he did his first big outdoor project in Sydney, in 1969. He wrapped a huge chunk of the coast up in Botany Bay. And he also did smaller works here, wrapping a couple of young eucalypts. 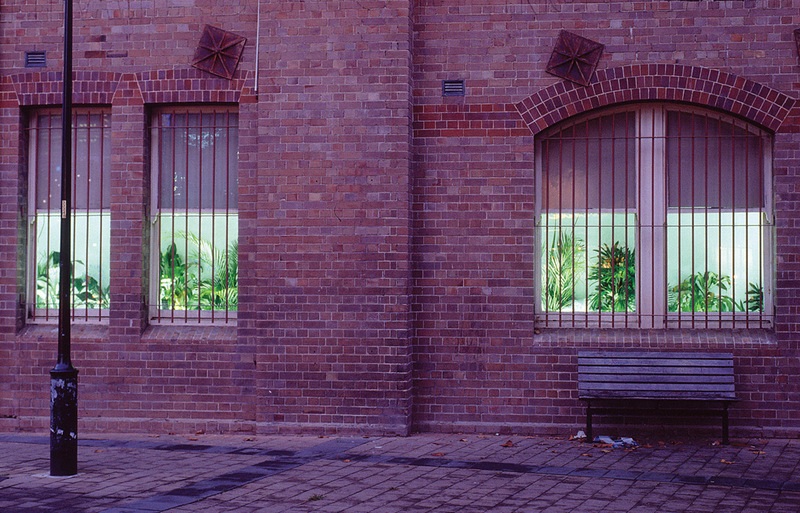 This work worried me for some reason, particularly the tree wrapping – it seemed sadistic. I imagined the plants inside slowly drying and dying inside the plastic; a photograph shows them arrayed like corpses on the grass. He did some wrapping works with women that are similarly alarming. It’s a two-edged act, this enclosure, this swaddling – both protective and pernicious. The notion of suffocation is implicit. The necessity of breath becomes an arbiter between subject and object, animate and inanimate.